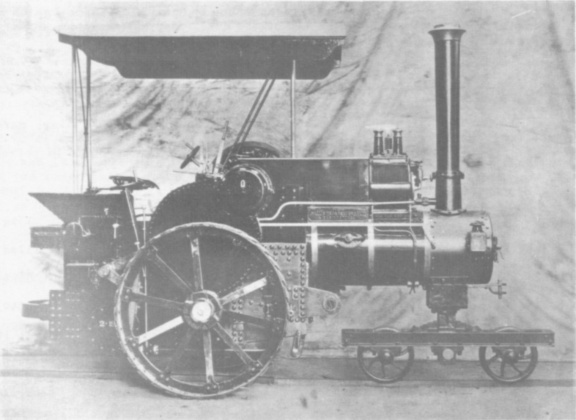 The photograph shows a Wallis & Steevens 4¼−ton single cylinder steam tractor which had been modified so that the front wheels ran in tandem in a trough or channel type rail (presumably laid in the middle of normal tramway track). The tractor was thus able to undertake shunting or perhaps haulage from a pit or quarry without the handicap of steering. It will be noticed that the steering wheel has not been removed, and it is probable that the tractor could be converted back for road haulage in much the same way as a "convertible" traction engine/roller. Unfortunately, I have no details of this little engine, but I suspect that the photograph was taken at the Wallis & Steevens works in Basingstoke, probably in the period 1905-1910. I also have a vague idea that this modification was the subject of a patent at the time.